This Banksy piece is probably one of the most well known, featuring heavily in his “Wall and Peace” book (2005). The image is seen in Jerusalem, preserved by a perspex overlay, but the location is a particularly prominent to the meaning of the picture: peace. In 2005 there was a gay parade in Jerusalem, which was attacked by protesters who stabbed three people and injured many more, this image could be a response to those events, or inspired by the violent unrest in the middle east, but we know that Banksy is a pacifist and anti-war, so the piece could have been inspired by a number of events. I believe it could be a response to the parade however, as the black and white man is depicted as a rioter or protester, with a bandana and cap to hide his identity, but as well as this, the flowers are in colour, vivid, multi-colour, which could be taken as symbolic of the gay pride flag. 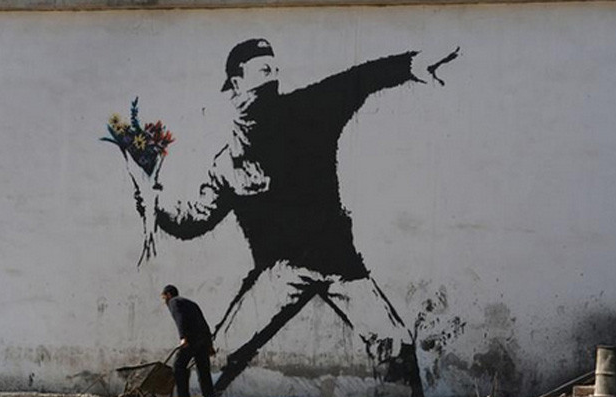 The image is reminiscent of the images from the 1960’s campus and street riots, it’s obvious from the stance of the man, his facial expression and posture that there is a violent intent, however by exchanging a bomb, or rock or “molotov cocktail” with flowers, Banksy has created a strong message: wage peace. A message that has been captioned on the image of the Flower Thrower by millions of people on the internet, which originates from a Poem “Wage Peace” by Judyth Hill, written after the events of 9/11 in 2001. By this message and all of the events that can be linked to the image Banksy has made it an important image to everyone. Banksy has effectively united all sorts of people with different beliefs because of the different ways to interpret this piece of his work, but he has done so in a controversial way, as there are a lot of people who disagree with pacifism and because of the location, in Jerusalem where there is a high gun and military presence. I, again, think that this piece of work is art, regardless of the medium. Art has generally got an opinion or message to convey and this image is an obvious attack on violence. I think that this is a piece of art, and I believe that the people who own the building agree, as they have preserved it. What do you think? Art or Vandalism?